President Donald Trump is moving to make over the liberal 9th U.S. Circuit Court of Appeals, which has delivered some of the most stinging judicial setbacks to his agenda. Trump announced three nominations this week to the San Francisco-based appeals court, which covers California, Arizona, Hawaii, Idaho, Montana, Nevada, Oregon, and the eastern part of Washington state. Earlier this month, the president renominated two other judges for the 9th Circuit. Senate Judiciary Chairman Lindsey Graham, R-S.C., will oversee the confirmation process for the nominees and said he hopes for bipartisanship. “I’m very supportive of the nominees submitted by President Trump to serve on the 9th Circuit Court of Appeals,” Graham said in a prepared statement. For the 9th Circuit, Trump announced his intent Wednesday to nominate Daniel A. Bress, 39, a lawyer with the firm of Kirkland & Ellis LLP; Daniel P. Collins, a former associate deputy U.S. attorney general who now is in private practice; and Kenneth Kiyul Lee, 44, a former associate counsel to President George W. Bush, also now in private practice. All three men are from California. Bress and Collins both clerked for the late Justice Antonin Scalia on the Supreme Court. Trump initially nominated Collins last year. Trump nominated last year, and this month renominated, Federal Magistrate Judge Bridget S. Bade, 53, of Arizona, and Eric D. Miller, 44, of Washington state, a partner in the law firm of Perkins Coie who works in its Seattle office. Trump initially also nominated Patrick Bumatay, 40, a federal prosecutor in California and former Justice Department lawyer during the George W. Bush administration, to the 9th Circuit. But on Wednesday, Trump instead nominated Bumatay as a judge on a lower court, the U.S. District Court for the Southern District of California. The 9th Circuit has six vacancies—three in California and one each in Arizona, Oregon, and Washington. Filling these vacancies would bring the balance to 13 judges appointed by Republican presidents and 16 appointed by Democratic presidents. The liberal 9th Circuit—sometimes called the “9th Circus” by conservatives—is among the appeals courts whose decisions are most overturned by the Supreme Court. However, some contend the court has become more moderate in recent years. In November, Trump bashed the appeals court, which was set to be the next court to hear a case on an administration immigration policy. Because it is the largest circuit court in the United States, some lawmakers have sought to break up the 9th Circuit into smaller circuits. But this would take an act of Congress. “It is no coincidence that litigants run to the 9th Circuit to challenge the president’s actions, where activist judges are more likely to apply a different standard of law,” Severino told The Daily Signal. 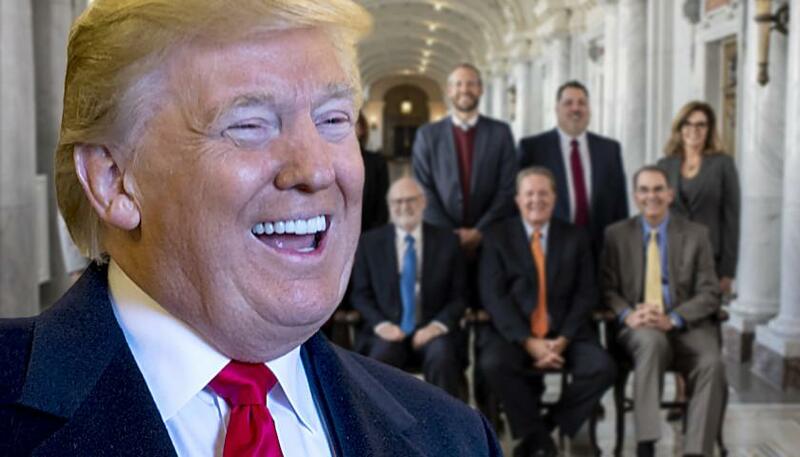 Trump’s nominees won’t change the composition of the court, since most of the vacancies on the court are a result of retiring Republican appointees, said Elizabeth Slattery, a legal fellow at The Heritage Foundation. But filling the vacancies is a positive step for Trump, she said. Currently, the 6th Circuit has the highest percentage of cases overturned by the Supreme Court, Slattery said, but the 9th Circuit hears the highest number of cases. Sen. Dianne Feinstein, D-Calif., the ranking member of the Judiciary Committee, and Sen. Kamala Harris, D-Calif., released a joint statement opposing Trump’s nominations of Collins and Lee. In fact, we even identified candidates selected by the White House we could support to demonstrate our willingness to work cooperatively. Unfortunately, the White House is moving forward with three nominees to a circuit court who have no judicial experience. The White House’s decision to push these nominees fails to secure consensus on the circuit court. A concession to them now on nominees would rightly be seen as political weakness. It would concede influence that neither senator has earned and set a precedent for other Democrats who would demand similar consideration. After reaction from several conservatives to the Journal editorial, the White House announced Trump’s intent to nominate the three men who weren’t previously judges to the 9th Circuit. Many expressed concern that the president’s staff, namely Cipollone, was working too closely with Democrats. However, after the White House announced the nominations, the Republican National Lawyers Association applauded in a blog post. “This was the first major test of new White House Counsel Pat Cipollone and he has passed with flying colors,” the GOP group said.